Hi friends, I'm popping in to say hi before I take a bit of a blogging break. I'm not sure how long the blogging break will last. Knowing my love of cooking and sharing recipes, probably not long. Pretty soon I'll be tempted by butternut squash and chili and pumpkin and all the goodness of fall food. 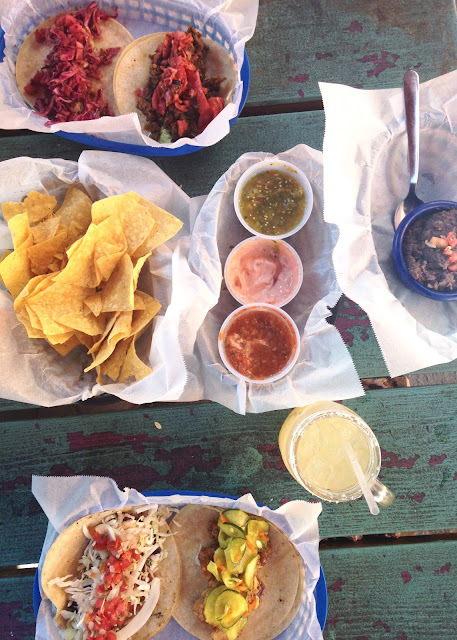 The tacos above are from the amazing White Duck Taco in Asheville. Enjoy your break! I think breaks like this are a healthy things every now and again. I hope you have a wonderful bread! Sometimes I do think about just straight up quitting social media ... haha There are days I think it is just not good for me! PS I am dying to try White Duck in Asheville - we didn't get a chance on our last visit! Sometimes a break and a recharge is exactly what one needs! I hope you have a fabulous break from blogging!